CareMonkey, an Australia-based school workflow automation company founded by CTO Martin Howell and CEO Troy Westley, recently announced it raised $2.2 million AUD in seed funding. This round of funding was led by IO Education chief academic officer Peter Bencivenga alongside New Ground Ventures and Rethink Education. What does CareMonkey do? 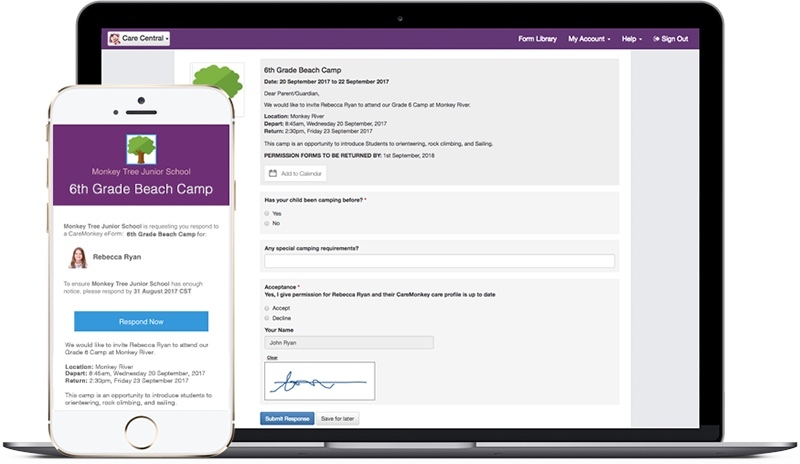 CareMonkey enables schools to streamline their paper workflow processes through a digital forms platform. CareMonkey is the leading software platform in Australia to help schools go paperless. And parents use the service to respond to forms for field trips, payments, medical updates, parent-teacher conferences, and other consent forms. And the company has scaled to more than 500 schools in Australia. “We want our teachers and school administrators to be academic innovators for their students, but they currently spend a large portion of their time dealing with paperwork. CareMonkey can dramatically lower this paperwork burden and help teachers spend more time on teaching and curriculum development,” said Bencivenga. Schools also use CareMonkey for managing administrative workflows like streamlining staff approvals, tutoring registrations, supply request, fee reimbursement, professional development, asset management, technology repair, and school maintenance management. With this funding round, CareMonkey is going to accelerate growth in the U.S. and U.K. markets. And the company is going to expand its product offering to help school districts better manage day-to-day paperwork and forms.